A jazz band, a big red London bus and gourmet cuisine were just some of the unique features of the Business and General Aviation Day (BGAD) 2011, held at Cambridge Airport and hosted by European Business Air News last week. James Dillon-Godfray, Business Development Director at Oxford Airport also commented on the high calibre of visitors. “I’ve not stopped talking all morning, and have had a lot of interest in what our airport can offer. Hot on the agenda of topics that people were talking about at BGAD was the Olympics and a morning seminar Question Time style moderated by Charles Alcock, International Editor of Aviation International News with a senior panel of aviation executives, tackled just how they are getting prepared for what will be the biggest event of the year – in just 10 months’ time. Cambridge Airport is just one of five airports that have been given 24/7 slot availability and it is already well under way in their Olympics preparations. Airport Director Archie Garden estimates they will have to recruit some 40 more people and training them up will take up to three months. Other airports with the green light to take traffic 24/7 are Northolt, Lydd in Kent, Manston and Southend. Oxford Airport will be open to midnight. Longer opening hours will be important because some of the events will not finish until 22:00. Terrific opportunities for these regional airports, yes, but a major challenge for the chauffeur car companies that need to get their VIPs and executives swiftly to the Games. Any executive coming into the area on their private jet may be able to get a slot into these airports and the primary ones such as Luton, Farnborough, Stansted etc, but once on the ground they will be the same as everybody else. "There will be a meeting in early October of the Licensed Private Hire Car Association (LPHCA) and things should become clearer," he said. 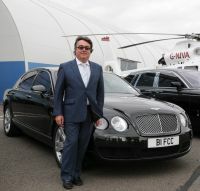 "At the moment as a chauffeur company who has invested in high end cars and chauffeurs for people who expect and are prepared to pay for a high standard of customer service, we are worried that the Olympics will prevent us from achieving our usual high standards when it comes to ground transportation." Another problem concerning access is the lack of helicopter sites and use of helicopters. The Games have been declared a ‘green games’ and helicopter movements will centre around London’s only licensed heliport – the London Heliport at Battersea. See related story. An afternoon seminar featured Magnus Henriksson, Business Manager from Avinode, the online b2b charter marketplace, discussing European Charter trends in 2011. While it may be too early to form a conclusion, Magnus suggested that the recent global economic jitters may have contributed to a greater reluctance to spend. Events such as snow in the UK in December 2010, the Icelandic volcano in April 2010, the Japanese Earthquake and Tsunami in March 2011 along with the Arab Spring early in the year have all led to considerable peaks in demand for air charter globally. “Business aviation is highly effective and in great demand in an evacuation situation,” he surmised. 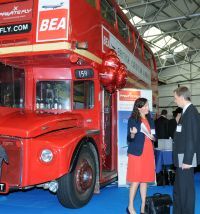 An eye-catching exhibit in the hall was a former London Transport Routemaster bus sponsored by Privatefly.com who announced a partnership with Addison Lee the UK’s largest mini-cab firm. For the first time ever Addison Lee customers can now book private jet charter alongside premium minicabs, chauffeur vehicles, taxi-bikes and couriers. 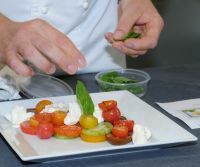 Attracting a large audience mid-afternoon was an impressive catering demonstration from London-based inflight catering service Alison Price On Air. Out on the static a number of aircraft were on display. FlairJet flew their stylish Embraer Phenom 300 in from their Oxford home. 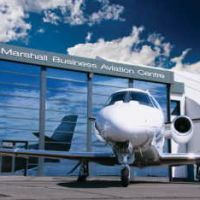 Base operator Marshall Executive Aviation displayed their whole fleet including their Stansted-based Challenger 300, an aircraft type which Bombardier just named a new Ambassador, none other than the actor and aviator John Travolta. He is the new face of the Challenger, Global and Learjet families. Embraer showcased a simulator of the new Legacy 500, currently on a worldwide tour and Cessna displayed a CJ3. Some of its senior executives were over to support the event. Also on the apron First Class Cars complemented the line-up with a stylish fleet of cars including Rolls-Royce Bentley, Jaguar and the new Range Rover Evoque.